Farmersgirl Kitchen: Making Whoopies on Sunday Morning! Perhaps this is not quite what you had in mind when you read the title of this post? But this is indeed a Whoopie Pie, it's a Croque Monsieur Whoopie Pie and I made mine large for a weekend Shake Up Your Wake Up Farmhouse Breakfast Week breakfast. 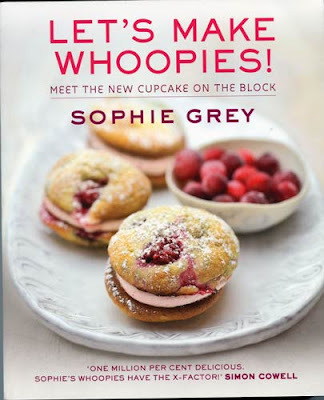 It comes from this beautifully presented book, Let's Make Whoopies by Sophie Grey, featuring recipes for over 70 whoopies as well as some over 30 cupcakes. Sophie Grey is the founder of the artisan bakery company Crazy Baker and will be judging the Pie Bake Off next Sunday 27th January, at the special showing of Nora Ephron's Julie and Julia at the Lexi Cinema in Kensal Rise. The competition to win tickets is open until 12.00 noon on Sunday 20th January. So what exactly is a Whoopie? Let's Make Whoopies has 7 chapters covering a wide range of flavours and presentation ideas. Chocolate Whoopies and Cupcakes has 18 recipes including Devil's Food whoopie, Brownie whoopie and Sachertore whoopie. Jaffa cupcake, Mississippi mud pie cupcake and White chocolate cupcake. Fruit, Vegetable and Flower Whoopies and Cupcakes gives us 16 recipes including Lime and Cardamom whoopie, Apple and Cinnamon whoopie and Beetroot whoopie. Spiced Pear cupcake, Courgette cupcake and Rhubarb food cupcake. And then the chapter which intrigued me the most: Savoury Whoopies and Cupcakes with 14 savoury treats including Sun-dried tomato and basil whoopie, Porcini whoopie and Croque Monsieur whoopie. Corn and chilli cupcake, Rye cupcake with smoked trout mousse and Feta spinach and dill cupcake. There's a fun chapter for Wacky Whoopies and Cupcakes with 15 fun bakes including Frog Prince Whoopie, Hairy Spider whoopie and Fower head whoopie. Alien cupcake, Ginger cat cupcake and Monster cupcake. Some lovely ideas in the Celebration Whoopies and Cupcakes with 15 small celebration cakes including Valentine's whoopie, Wedding whoopie, Easter Bonnet whoopie. Easter nest cupcake, Halloween Dracula cupcake and Christmas cupcake. And finally Specialist Whoopies and Cupcakes with 14 bakes for those with allergies and intolerance, these include Egg free apple plum and cinnamon whoopie, Gluten free lime drizzle whoopie, Sugar free sweet potato, carrot and sultana spelt whoopie. Gluten free orange almond cupcake, Egg free vanilla sponge cupcake and Egg free chocolate cupcake. 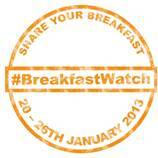 It's Farmhouse Breakfast Week from 20th - 26th January and I'll be blogging about breakfast all week. You can follow @breakfastweek on Twitter and tweet a picture of your breakfast every day with the hash tag #BreakfastWatch. You can also post your photos to Facebook, Instagram and Pinterest. 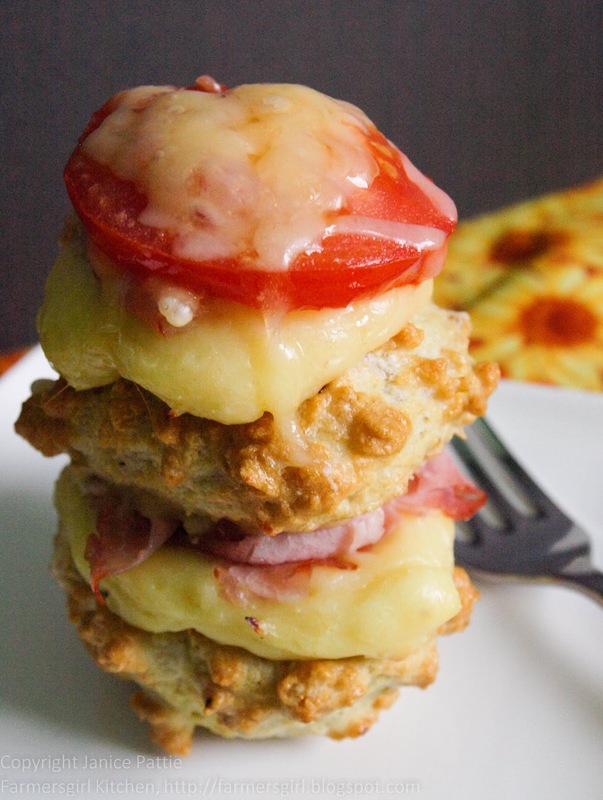 The Croque Monsieur whoopie contains many of the ingredients of a cooked breakfast: ham, eggs and tomato and ideal for a special breakfast. It's made from a basic whoopie recipe with added cheese, salt and pepper. The two 'sponges' are sandwiched with a very thick bechamel with added cheese and a small slice of ham. You then add a little bechamel on top, a slice of tomato and a little more grated cheese, then back in the oven for 5 minutes. You can make the whoopie sponges and bechamel and then assemble and reheat in the morning. I made half the quantity of the recipe and made them big enough for a meal, rather than a bite sized canape as shown in the book. They were very filling but I would say it is quite a lot of work for what you end up with so would need to be for something special. I will definitely try some of the sweet whoopies though, I really like the look of of these recipes. I'm adding this to Breakfast Club which is all about Cooked and Baked breakfasts and runs until 24th February right here at Farmersgirl Kitchen. This looks really tasty. I agree it would have to be a special occasion to make it though. Wow that's impressive for Sunday morning! We had bought toasted hot x buns..that I burnt oops!! 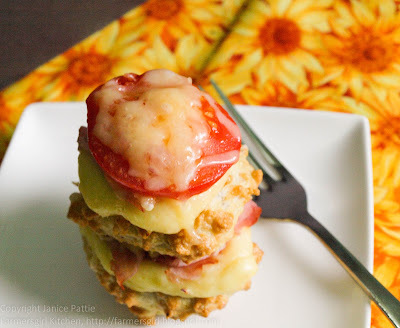 LOVELY photos Janice and I see you and I are on the Farmhouse Breakfast week! Did you receive their lovely hamper? I love your recipe and photos today and I am a BIG brekkie fan, so whoopie pies for me! Yes Karen, I got the hamper, many nice things in there for breakfast, lots more posts this week. Fabulous - I love it. The photograph is wonderful too.